Get your Moldova Tourist eVisa Now! Copy of passport valid for at least 3 months before the intended date of leaving the territory of the Republic of Moldova. Travel medical insurance valid on the territory of the Republic of Moldova (minimum cover 30.000 euro). 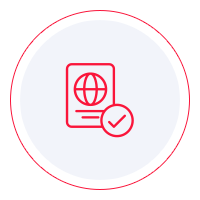 NOTE: Travelers must have their passport with at least 6-months validity from the date of arrival. What is the Moldova Tourist eVisa? An eVisa is an authorization to enter Moldova issued in PDF format. An eVisa grants the same right to enter Moldovan territory, as ordinary sticker-visa in the passport. What do I need to apply for a Moldova Tourist eVisa? What is the cost to obtain the Moldova Tourist eVisa? Standard Processing Time - USD 20: 20 business days. Rush Processing - USD 30: 15 business days. Super Rush Processing - USD 50: 10 business days. NOTE: Children under 18 can apply for a FREE VISA. How long does the Moldova Tourist eVisitor process take? Standard Processing Time: 20 business days. Rush Processing: 15 business days. How long is the Moldova Tourist eVisa valid for? eVisas are valid for 180 days from the date of issue. It can be used for multiple entries during the period of validity. Which countries are eligible for the Moldova Tourist eVisa? How long can I stay in Moldova with the Tourist eVisa? The Tourist eVisa allows you to stay a maximum of 90 days and is a multiple entry eVisa. What documents should I need to present at border crossing point? Medical health insurance for the period of stay in the Republic of Moldova. Where can I read more about Moldova?